So Bob Prechter is bearish again. That may be no surprise to some, but recall that Prechter was about the only bull on February 23 of this year when he covered the short position he had recommended on July 17, 2007. That was nearly two years later and 800 points lower in the S&P. And the Daily Sentiment Index (DSI) reading for the S&P had gotten down to only 3% bulls! His February 2009 Elliott Wave Theorist explained, “The market is compressed, and when it finds a bottom and rallies, it will be sharp and scary for anyone who is short.” Elliott Wave analysis, the DSI, and other indicators suggested it was time for a Primary-degree bear market rally. And that is what we got. Now in his August 2009 Theorist, Bob explains what “the prudent thing to do” in the markets is, based on the same Elliott wave pattern and sentiment indicators — plus the Dow’s 3/8 Fibonacci retracement from the March 9 low. For more analysis from Robert Prechter, download a free 10-page July issue of Prechter’s Elliott Wave Theorist. In its broadest sense, the Wave Principle suggests the idea that the same law [the Golden Ratio] that shapes living creatures and galaxies is inherent in the spirit and activities of men en masse. Because the stock market is the most meticulously tabulated reflector of mass psychology in the world, its data produce an excellent recording of man’s social psychological states and trends. This record of the fluctuating self-evaluation of social man’s own productive enterprise makes manifest specific patterns of progress and regress. What the Wave Principle says is that mankind’s progress (of which the stock market is a popularly determined valuation) does not occur in a straight line, does not occur randomly, and does not occur cyclically. Rather, progress takes place in a “three steps forward, two steps back” fashion, a form that nature prefers. More grandly, as the activity of social man is linked to the Fibonacci sequence and the spiral pattern of progression, it is apparently no exception to the general law of ordered growth in the universe. … The briefest way to express this principle is a simple mathematical statement: the 1.618 ratio. Bob Prechter’s August Elliott Wave Theorist published a week and a half early: he did so to give subscribers time to prepare for what’s ahead. The issue provides a list of levels that mark Fibonacci and Elliott-wave related retracements for the rally. He analyzes which one is the most likely end point, and even explains how you can make the most of the waning rally. You don’t have to be taken by surprise. Get the latest Elliott Wave Theorist and you’ll see where the rally is likely to end. Think about the difference this knowledge can make for you. 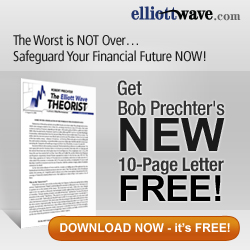 For more analysis from Robert Prechter, download a FREE 10-page July issue of The Elliott Wave Theorist. It challenges current recovery hype with hard facts, independent analysis, and insightful charts. You’ll find out why the worst is NOT over and what you can do to safeguard your financial future. Neil Beers has a bachelors degrees in political science and philosophy, and a masters in classical languages. His broad range of study and focus on ancient and modern thought led him to Elliott Wave International to research and write about the Wave Principle, Socionomics, and human social behavior. Is this post an ad? Prechter also missed one of the greatest bull markets in history 1996-2000…and hasn’t he called for Gold to go down to $650 an ounce?